Contact Us at 1-877-922-1790 during regular business hours or nights, weekends and holidays at 1-800-554-8969. Immediately notify Hometown Bank and any other financial institutions at which you have accounts. We can help you reverse any unauthorized transactions made against your Hometown Bank accounts as well as reports submitted by us to credit bureaus. Then, we'll do all we can to prevent this problem from occurring again. Call all three credit bureaus and ask for a "fraud alert" to be placed on your file. This ensures creditors will call you before opening new accounts in your name. Even if you do not find any signs of fraud on your credit reports, we suggest you recheck them every three months for the next year. Just call one of the numbers above to order your reports and keep the fraud alert in place. Ask your local police department to file a report. They may or may not apprehend the identity thief, but having the report on file may help you clear your credit status in the future. For more information on identity theft, contact the Federal Trade Commission by visiting www.consumer.gov/idtheft, calling toll free 877-ID-THEFT (877-438-4338), or writing to FTC, Consumer Response Center, Room 130-B, 600 Pennsylvania Avenue, N.W. Washington, D.C., 20850. 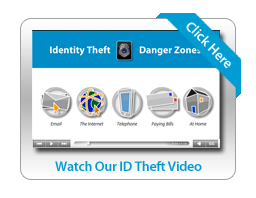 Obtain an identity theft affidavit by visiting http://ftc.gov/bcp/edu/resources/forms/affidavit.pdf. Use it to report the existence of a fraudulent account under your name to other companies. Your identity is one of the most valuable things you own. It's important to keep your identity from being stolen by someone who can potentially harm your good name and financial well-being. Identity theft occurs when someone uses your name, address, Social Security Number, credit card or financial account numbers, passwords, and other personal information without your knowledge to commit fraud or other crimes. While the words may sound like a foreign language — Phishing, Pharming, Vishing, Spyware, Dumpster Diving — they are actually techniques used by thieves to put your identity and finances at risk. In addition, their attacks grow more frequent and sophisticated every year. Identity theft is the fastest growing crime in the United States. According to US Department of Justice statistics, it's now surpassing drug trafficking as the number one crime in America. For more information on how to protect your security, view demo. Criminal fraud takes place when your personal information is used without your permission to access your financial assets. This is why it is so important to understand your risks and take precautions to reduce your odds of becoming a victim. We use only the most trusted and proactive security resources. Your account information is protected with encryption whenever you are connected to your account at Hometown Bank. After 15 minutes of inactivity, we automatically discontinue your online banking session and log you out of your account to block others from accessing it. All your electronic banking activities are monitored by sophisticated fraud software. We contact you immediately if any suspicious account activity is detected. When choosing your password, use letter and/or number combinations that would be difficult for a stranger to guess but are still easy for you to remember. Avoid using common, easy passwords like birthdays, anniversaries or names. Never give your password to anyone, not even a bank representative or someone who is helping you log into your account. Never send personal information via email, phone or text. When online, ensure that the website uses encryption (such as seeing "https" in the address bar). Only then should you type personal information or passwords onto a page. Only do business with companies you recognize as those you have accounts with, but be aware that unsolicited emails or letters may be fraudulent. Do not use the "Remember me" option on financial websites. Always review your monthly bank statements, credit card bills and accounts for suspicious activity. Keep your computer's antivirus software up-to-date. Make sure you have antivirus software installed. There are programs that also prevent malware from being installed. A good rule of thumb is, always treat emails from unknown sources as potential threats. This doesn't mean you should panic; it means you should always be vigilant. Make sure your antivirus protection is always up-to-date. If you suspect unauthorized access to your computer, take it in to a trusted computer technician or service to have it examined. Use a firewall. A firewall is typically software (but sometimes hardware) that blocks unlawful access to your computer. Beware of pop-up windows that advertise special offers or those that warn you that your computer may be infected. These may actually compromise your computer's security! Do not install pirated software. Stay up-to-date with operating system and other software updates such as those for your Internet browser and Microsoft products. If you get an email offering these updates, do not click a link in the email. Rather, use the system update program that comes with your computer. A good password is one that others could not guess easily but that you can remember. By making it memorable, you never have to carry it in your wallet or keep it on a piece of paper in your desk drawer – neither of which should ever happen. Avoid using common, easy passwords like birthdays, anniversaries or names. Some websites have specific requirements for passwords, such as beginning with a capital letter and containing a number. Others give you more freedom. Always opt for the more unusual combination of letters and numbers and, where available, symbols such as the exclamation point as well. Create unique logins for online banking that you don't use anywhere else (for example, social media). Thieves can take hard drives out of one computer and load them onto another to read their contents. With the right skills, these criminals can even salvage previously deleted data. Specialized software is available so you can permanently erase your hard drive. Or, you can remove the hard drive from your computer and physically destroy it and the platters inside. Just as there are convincing looking websites, there are equally convincing looking emails that contain links to fraudulent websites. These emails may look like they came from Hometown Bank or another trustworthy sender, but you can often detect something not quite right. A need for personal information. Hometown Bank will never request your personal information, not even your ATM PIN. Urgent requests and system updates. Many of these scam emails state that your account may be closed if you fail to confirm, verify or authenticate your personal information via email. We would never contact you about a security problem in this manner. Offers that sound too good to be true. Beware of emails containing a customer service survey that promises some type of reward for your time, only to be asked for your account number to receive the reward. Typos and other errors. A good deal of fraudulent emails are generated by foreign or poorly educated individuals, so you will often find typos, grammatical errors, awkward language and abnormal visual design. A logo may be an older version or the wrong color. Delete any suspicious email you receive. Before clicking any links on a legitimate looking email, hover over the link with your mouse pointer and examine the destination for that link when it pops up or shows along the bottom of your program window. If the pop-up address doesn't point to the correct site, that's the sign of a potentially disreputable website. Only download files and attachments you trust. Just because a good friend sent you a joke, screensaver or other file type, doesn't mean it's safe. Many people unknowingly download Trojans or viruses and end up sending them to all their email contacts. Many online ads ask for personal or financial information. Never enter this information on a site unless you trust the company behind it. Make sure your antivirus and other security software is set to update at least weekly. Run periodic system software updates as well. Some cybercriminals now use computer telephony – Voice over IP – to make calls to you. You'll receive an automated message telling you unusual activity has been detected on your bank account. You are instructed to contact Hometown Bank (your caller ID may be tricked into displaying "Hometown Bank"). You may also receive emails and text messages that include fraudulent phone numbers. A good way to know if the call is real or not is to simply call your local Hometown Bank using the phone number you normally use. Then, let our office know about the call or message you received. Scam artists are putting up especially convincing imposter websites. Some of them can fool even the experts. Look in the address bar. You should see "https" at the beginning of the address, indicating the connection to that site is "secure." Most legitimate websites begin with "http." It does not mean that other sites cannot be trusted; it merely means they are not protected with additional security for activities such as online banking. Look for and click on the lock icon to view the site's digital certificate. Burglars and identity thieves can be quite sophisticated. They watch for subtle cues, like a mailbox that has mail in it for several days, or a driveway that isn't shoveled in the winter, which may indicate you're not home. Pause your mail through the U.S. Postal Service or have someone pick it up each day. If you are going to be gone for an extended period of time, you can arrange for a family member to visit the Post Office once a week to pick up your mail and watch for important letters or bills that need to be paid. Switch to E-Statements and online billing. Whether camping up north for the weekend or spending three week's vacation in a foreign country, put your mind at ease knowing that your banking information is safe. You will have access to all the same information as paper statements, and the service is FREE.